The Stone Flower, a decidedly Russian ballet based on the Ural fairtytale by Pavel Bazhov, first appeared in 1957 and is said to have started Yuri Grigorovich on his career as a young choreographer. The work focuses on the story of a young stone carver, Danila, who will stop at nothing to uncover the secrets of his art form, venturing to the underground lair of the Mistress of the Copper Mountain in order to reveal the secrets of the stones, and in so doing, leaving his earthly beloved, Katerina, behind. While far from Prokofiev's best work -- the great composer seems to trudge through the score at numerous points, lending a heaviness that one does not sense, for example, in his Cinderella -- Stone Flower, nonetheless currently runs on at least three of Russia's major stages: the Mariinsky, Bolshoi, and Stanislavsky Theatres, all of whom perform Grigorovich's version. Oksana Kardash, veritable prima of the Stanislavsky Ballet, is blessed with rubberband-like flexibility that is never exaggerated, a highly arched back, and lyrical nuance that underscored the femininity of her character, Katerina. A flurry of bourrées on sharply arched feet decorated her first entrances in between the toe-tapping jigs that emphasize the peasant nature of the Ural people. With lines that suggest a young Juliet, Kardash has a lovely stage manner that projects easily to the back of the hall. One believed in her love for Danila, and later her despair (sudden tears when he is too distracted by sculpture to notice her). Maria Beck, a graduate of the Bolshoi Academy's three-year preparatory course, danced the role of the Mistress of the Copper Mountain. Beck, who hails from Detroit and has dual citizenship (her mother is Russian) did great justice to both the technical and visual challenges of a sparkling green unitard --she has an impeccable physique-- endowing the Mistress with the right mixture of cunning and mystery. 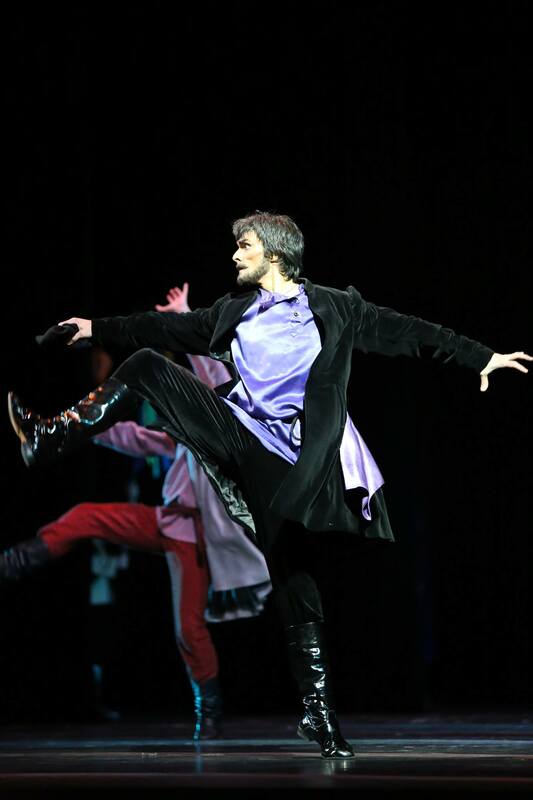 Danila, danced by Aleksey Liubimov, portrayed a simple Ural boy nearly obsessed with stone carving. If anything, his portrayal erred further on the side of peasant man than heroic stone carver, but he nonetheless formed a close connection with the ballet's theme throughout. Of particular note was the evil nearly dripping from Georgy Smilevsky as Severyan, apparently wealthier than the other peasants per his purple silk shirt, who arrives insisting he receive his malachite vase prematurely. His attempts to steal and seduce Katerina fail the first time around, and his ultimate demise through the trap door in the stage floor (in the final act) form one of the dramatic highlights of the evening. Indeed his shock at the Mistress' ability to determine matters of justice by punishing him immediately shifts his evil character to one begging for mercy. The Act II amethysts --performed by both male and female members of the corps de ballet-- perhaps appear outdated on today's stages, but this choreography, with bent elbows and right angles, all done in pale purple unitards -- would have been ground breaking at the ballet's debut in 1957 and a great departure from the tutu-shorn dancers of Petipa's heritage. Likewise the lengthy street festival scene in Act II that presents numerous gypsy dances followed by peasants celebrating the May festival provides contextual relief from the progression of the libretto on the one hand, but distracts from the story's flow on the other. Stone Flower nonetheless holds value today, at least for its historical context if not for the unique genre that it presents in the universal ballet catalogue. The dancers of the Stanislavsky easily fulfill the demands of this unique work with quality and devotion that is on a par with the country's leading troupes. All photos by Sila Avakuum. From top: Oksana Kardash with Aleksey Liubimov; Maria Beck as the Mistress of the Copper Mountain; and Georgy Smilevsky as Severyan.